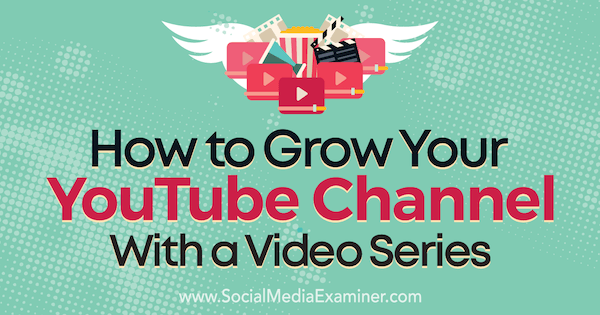 In this article, you’ll discover how to develop a video series that helps turn one-time viewers into YouTube channel subscribers. By creating a topical video series that addresses those queries, you can become a valuable resource for your audience, while attracting new viewers and establishing yourself as an authority in your niche. In turn, your YouTube channel will grow. The video planning process starts with generating viable video topic ideas. You want to choose topics that will attract the right audience and community to your YouTube channel. A good place to begin brainstorming video topics is to look at your YouTube Analytics to see what your most popular videos are and use them as seed ideas for future videos. 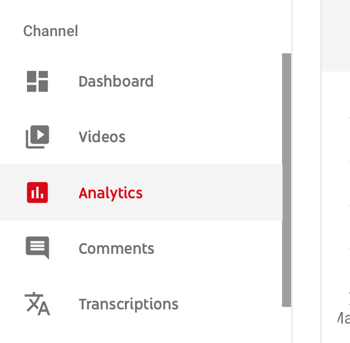 To find these metrics, go to YouTube Studio for your YouTube channel and click Analytics in the left sidebar. Then scroll down to the chart showing Top Videos. From here, you can add relevant metric columns like Unique Viewers, Average Percentage Viewed, and Likes. Use this data to determine which topics your audience enjoys on your YouTube channel, and make a list of related topics you can create more videos about. You can also use Watchtime and Viewer Retention metrics to guide future video topics. 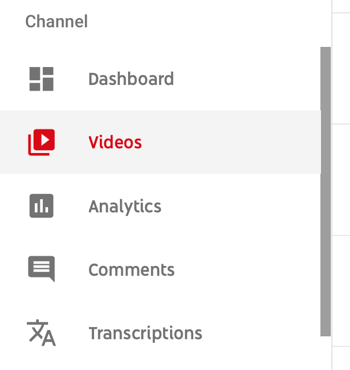 To see this data for a specific video, go to YouTube Studio and select Videos on the left. Then on the right, select the video for which you want to see data. Next, click on Analytics in the left sidebar to see the analytics for that video. 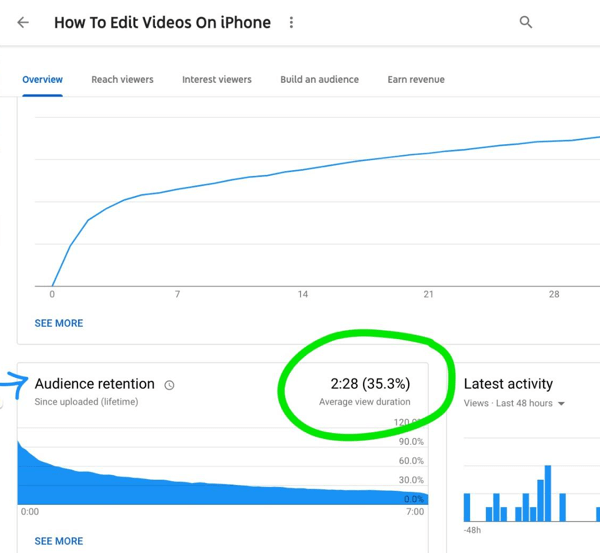 On the Overview tab, look at the Average View Duration in the Audience Retention graph. In this example, the audience retention is 35.3%. The graph reveals where viewers are dropping off to watch a different video or going back to the search results. To see the search phrases that brought viewers to your video, click the Reach Viewers tab at the top of the page. Then open the Traffic Source: YouTube Search report. Examining this data will help you understand what viewers are searching for and identify potentially related topics they may find interesting on your channel. This should give you a good idea of what topics to pursue to grow your YouTube channel and outline your video series. If you don’t have a YouTube channel yet, check the Google Analytics for your blog or website. Make a list of topics related to your most popular pages and posts and use it to come up with a list of viable video topics. You can also ask your audience for input. Use an email survey or post an Instagram story poll to find out what they’re interested in. By asking for their input, you’re including them in your planning process and at the same time learning about what they’re struggling with. You can provide the solutions they’re seeking in your video series. Pro Tip: Consistently providing content on YouTube is one of the biggest challenges as a video content creator. One technique that can help is to plan a month’s worth of YouTube content at a time. That way you’ll never be without a great video topic idea! After you develop a list of potential video topics, the next step is to assess the searchability of these topics. 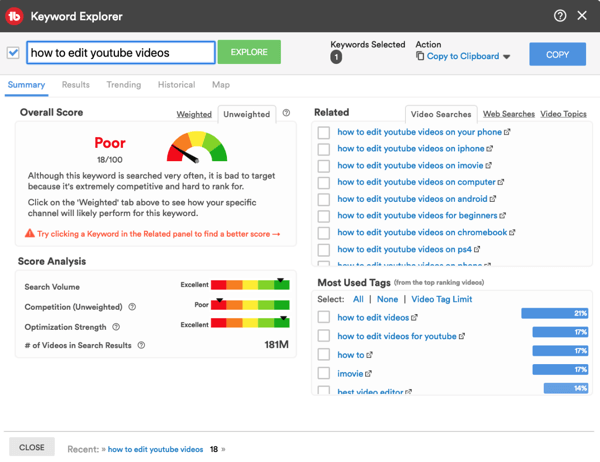 Perform keyword research to help ensure your video topics align with what viewers are searching for on YouTube. Tools like TubeBuddy (free and paid plans starting at $9/month), VidIQ (free and paid plans starting at $7.50/month), or MorningFame (plans starting at $4.90/month) can help. 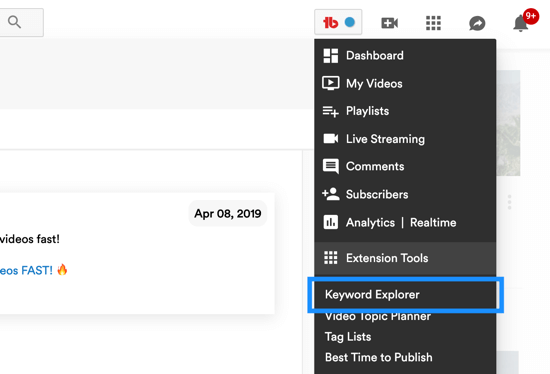 TubeBuddy’s Keyword Explorer is one of my favorite tools because it’s easy to use. While this tool is available with the free TubeBuddy plan, consider upgrading to a paid plan to get more detailed results. Start with an idea for a search phrase and plug it into the tool. Then look at the search results to review the data about search volume, competition, optimization strength, and number of searches. 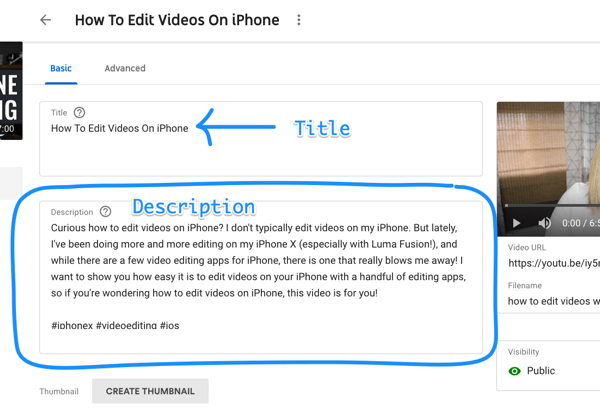 After you identify viable keywords, work them into the video’s title, description, and tags. You need to tell YouTube what your videos are about so it knows where they fit on the platform. 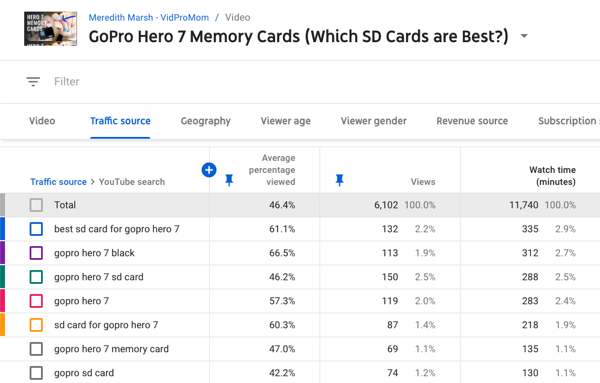 Providing detailed information improves the chances that the right viewers will find your videos in search results or in the Recommended Videos sidebar. When you publish your video, include the search phrase you want to rank for in YouTube’s search results in the Title field. In the description, fill in as many details as possible about the video. 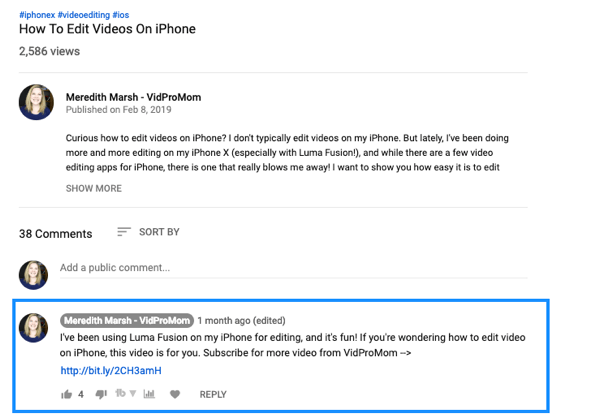 You can also add links to related videos, a corresponding post on your blog or website, or even affiliate links in the description. 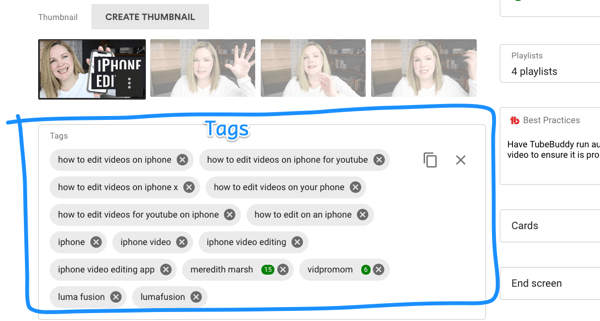 In the Tags box, include the title of your video and any related search terms that apply to your video. Start by creating a series of five videos. When planning the series, choose topics that are directly related to one another. This way, when viewers find one of your videos, it will be easy to encourage them to watch another video in the series. From a tactical standpoint, a video series works well on YouTube because you can link to the “next” and “previous” videos in your series through the video’s endscreen, YouTube cards, and links in the video description. Pro Tip: If you have an audience on another platform such as a blog, creating a short series on a niche topic is a great way to get your audience excited about subscribing to your YouTube channel. YouTube cares deeply about the Watch Time and Viewer Retention metrics, so it’s important for you to understand this data. The most straightforward way to take watchability into consideration is to get to the point as quickly as possible in each video. If you create a how-to video, for instance, start showing the steps or process in the first 60 seconds. When people are searching for a solution, they’re hoping to find that solution as quickly as possible, so a short introduction explaining what you’ll be teaching in the video will help provide it. Another tactic is to include a link to your channel in a pinned comment. Anytime you prompt the viewer with a call to action like “Subscribe for more videos,” followed by a link to your channel, you’re increasing the chances that they’ll follow through. Remember that YouTube channel growth doesn’t necessarily equate to business growth, and growth in number of subscribers doesn’t directly earn you more revenue. However, because YouTube is such a powerful search engine, attracting viewers can help you generate leads. Download a free guide (your lead magnet). Opt into a free webinar by subscribing to your chatbot. All of these actions can help bring a YouTube viewer into your sales funnel or community where you can continue to serve them. It’s not uncommon to provide a lead magnet along with a YouTube video for list-building purposes. I often offer a one-page cheat sheet PDF or a summary of the content. I put a link in the video description and mention it in the video, directing viewers where to download the cheat sheet. As you generate leads for your email list, use a nurture sequence to help new subscribers get to know you and learn about your products or services. If you have a sales funnel, YouTube is a powerful way to attract leads that convert to customers through your sales funnel and process. This process doesn’t have to lead to an email list, though. Chatbots work in a similar way, but instead of email, you can communicate with potential clients and customers through an automated (or manual) Facebook chat. This has become a popular list-building method, and tools like ManyChat and Chatfuel make it easy. This research and planning process will help you discover which solutions and answers your ideal audience is looking for on YouTube. By creating a video series that provides the knowledge they’re seeking, you’ll be well on your way to creating content that will attract the right audience and community and help grow your YouTube channel. What do you think? Are you inspired to create a video series for your channel? How do you decide what topics to cover in your videos? Share your thoughts in the comments below. Learn how to use six tools to improve your YouTube video exposure. Discover how to set up and deliver stories on YouTube. Find out how to remarket to people who watch your YouTube videos. Meredith Marsh helps bloggers and content creators get serious about profitability on YouTube! Join the Video for Bloggers & Content Creators Community on Facebook.